12-pack: Professional Quality Highlighter Just $2.99 Down From $14.99! Ships FREE! You are here: Home / Great Deals / 12-pack: Professional Quality Highlighter Just $2.99 Down From $14.99! Ships FREE! 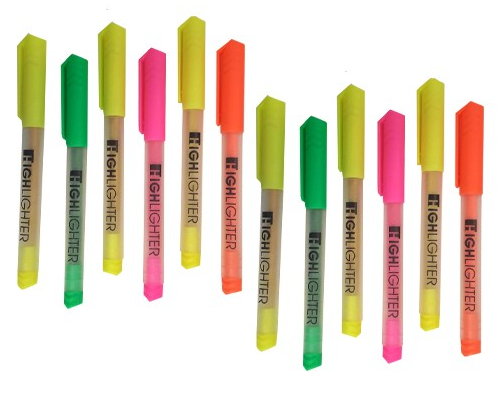 GearXS has this 12-pack: Professional Quality Highlighter on sale for $2.99 (Reg. $14.99) + FREE shipping! Make studying, reading, and memorizing easy. The Professional Quality highlighter is long-lasting and looks great. It’s perfect for the classroom, office or home. The high collection of colors will allow you to separate ideas and notes for improved clarity. Make sure to order now and stock your supply closet, briefcase or book bag.